I think Johnny is referring to a type as an archetype. Not hand shape....hand type. Type would include the lines. Okay, no need to talk about the lines. PS. Lynn, what I only meant to say is that when Fincham talks about a specific type of hands, he always starts describing hand shape + the typical characteristics for the hand lines. After noticing this, this remembered me of that you and I had tried to summarize the key-features to describe the hand types earlier in this discussion. Thanks. Hand type is better. Yes I now see how Johnny has mentioned lines in each paragraph about hand shape, but he is talking about pure archetypes (he explains this on page 23). Whereas most hands are a combination of all elements. I think the problem is that Johnny has tried to show pics that display various eg water features in his water hand shape pic, fire lines in his fire hand pic. I am sure he could have found a more pure water hand shape for W1 if he were not also including lines etc. Patti wrote: I think Johnny is referring to a type as an archetype. Not hand shape....hand type. Type would include the lines. Yes Patti I agree. Hand SHAPE is one smallpart of the analysis of a hand and only refers to shape of palm & length of fingers. If someone had an archetypical hand TYPE, that would include not just the lines but the skin texture, fingerprints, flexibility etc. Fingers are too long for earth hand. I would say it is an earth/air combination. You can't use the outline - there is a wide gap between the pen and the hand. But even if you used the outline, the palm is not square. The wrist crease is missing, as is the crease where the middle finger joins the palm. It has a rectangular palm and the fingers are only just above average - but they are not short, so it is a water hand. Yes it is a fire shape hand but I could see an argument for fire/earth combination as the finger is slightly shorter than width of palm. Regarding E3 being a combination of earth/air combination... I agree! By the way, the 'frame work' suggests the same with a slight preference toward air. Regarding W1, I agree with most of your comments. Though I think I have a more specified observation regarding the palm shape. Because the 'frame work' also suggests that the average palm shape shows a ratio of 0.78 for palm breadth versus palm length. I found a ratio of 0.77 for W1 - slightly below average... so I think this is actually quite a normal hand shape - which explains why the 'frame work' sort of points out to a combination of air and water. Does this make sense now? - Though I agree that it is hard to say how accurate my measurements really are, as the finger crease and the wrist crease are not visible. Regarding F1, yes I sort of agree with your comments. Though from my experience I suspect that E1 actually has a significantly wider palm shape than W1... but one has to account here that at the thumb side the upper palm probably did not make an accurate print on the paper! Only when one ignores this effect... then it might 'appear' as long, but it is probably not - typically a male hand, I would say. Hmmm.... these issues sort of point out that it is very hard to make measurements from hand prints. But except for the last example, the 'frame work' appears to work just fine and sort of delivers a much more detailed result - but proper measurements are required! Just wondering Lynn, what is your thought regarding the 'frame work' for hand shape as described in my picture - after our discussion so far? "The 'pure' elemental hand shapes we shall explore........... from simple observations. Pure types are where a set of characteristics in terms of palm shape, finger length and line quality combine to create an elemental archetype." Sorry Lynn, I observe that Fincham here clearly connects the word 'pure' with hand shape. And again, in the 2nd sentence he is using the words 'palm shape'... and not 'hand shape'. And on the same page he is talking about 'the overall shape and form of the hand' - as the first level of hand reading. And skin texture is the 2nd level. So, it is quite obvious for me that 'line quality' is associated here with 'shape and form of the hand'. Anyway, I have described my observations - not really important I guess. Martijn (admin) wrote: PPS. Maybe it is a bit confusing that Fincham starts talking about the hand lines inside his chapter about 'The Elements of Hand Shape'. "The 'pure' elemental hand shapes we shall explore.. from simple observations. Sorry Lynn... Fincham mentions here the words 'palm shape'... and not 'hand shape'...!!!! This clearly suggests that Fincham does define 'hand shape' as a combination of 'palm shape', 'finger length', and 'line quality'. Hmmm, while I corrected my earlier posts... I now realize that my words very precisely reflected Fincham's ideas. Anyway, don't worry Lynn... no need for me to continue about the hand lines. yes it is confusing. But if you read page 23 he explains that he is talking about pure archetypes. by the way Johnny realised that his chapter on hand shape was confusing, which is why he completely omitted hand shape from his second book "Apprentice to pro in 24 hours". He does contradict himself in your above quote, talking about 'pure' elemental hand shapes then Pure types which are not the same thing! but page 14-15 he also explains how handshape is a spectrum from broad to narrow, long to short etc. Sorry Martijn I disagree that your words very precisely reflected Fincham's ideas. I can assure you that Johnny does not classify hand shape according to lines etc. Read it again - he doesn't say 'pure hand shape' in this sentence, he says Pure types are where a set of characteristics in terms of palm shape, finger length and line quality combine to create an elemental archetype." archetypes, not hand shape. (edit) i.e. the elemental archetype includes hand shape (palm shape & finger length) and also line quality. I think you are correct that each reader (from any school) goes on to develop their own methods. It might be interesting to note that I see very few air shape hands, whereas Johnny himself has air shape hands and reads for lots of people who have air shape hands (so square palms and long fingers are 'normal' to him, but 'quite unusual' for me! vice versa for earth hands) Maybe that explains his extra 2.5% criteria for long fingers, and my lower criteria... his 'normal' or 'average' client has longer fingers compared to my 'normal' or 'average' client! Okay, that is essential here for me to hear and to know... sounds like Johnny is not very happy about his chapter about 'hand shape'. PS. Lynn, from my experience I know that sometimes hand readers may see long fingers in a person, while other hand readers observe short fingers for the same hands. I think the methods being used might be involved - yes, the social circles also may play a part.... but basically, my research points out that Fincham's criterium of 87.5% might (likely) be far too high - because that percentages probably relates to 'abnormally long fingers' (probably seen in only about 3% to 5% of people). Here is how Gettings describes the differences in the four hand shapes and how to measure them. He also notes that the measurements in a hand print are not true to the actual hand when he mentions to add a little for the finger being shortened in the printing process. - Fred Gettings "The Book of the Hand"
Martijn (admin) wrote: basically, my research points out that Fincham's criterium of 87.5% might (likely) be far too high - because that percentages probably relates to 'abnormally long fingers' (probably seen in only about 3% to 5% of people). for hand shape as described in my picture - after our discussion so far? Yes, I can see the potential in your framework. I'm starting to see it now. Especially after our discussion & some adjustments in assessing the handshapes, and thinking about where I would place them on the diagram (eg your comment about placing W3 lower).... helps me to see how this framework could work! It could also be useful in plotting combination hand shapes! and can also show the 'spectrum' of handshapes that Johnny talks about. I can see some great potential in this! Patti wrote: Here is how Gettings describes the differences in the four hand shapes and how to measure them. He also notes that the measurements in a hand print are not true to the actual hand when he mentions to add a little for the finger being shortened in the printing process. Thanks Patti, I had forgotten about Getting's compass method! Yes, once again we have the confusion between 'hand shape' and 'hand type'. But for this discussion I think we should focus on 'hand shape' as much as possible. Yes exactly: the 'frame work' can also be used to describe specific combinations of hand types! I think these hand type combinations can be visualized near the diagonals between the corners of the central box which describes the normal variations (and these diagonals can of course also be extended outside the central box). PS. The 'frame work' indicates that combinations of fire + water hand types and earth + air hand types are probably much more rare than the more likely combinations of air + water hand types and earth + fire hand types. Because fire + water and earth + air require a very unusual palm shape (with sort of contradicting extremities - such as for example: long palm length + short palm breadth, and short palm length + long palm breadth). Is this somehow confirmed by your experience? PPS. The rectangle-shaped 'central box' is a bit of a theoretical construct. We could also think about the idea to create some kind an oblique elipse-shaped figure positioned 'central box' which should represent the most common hand shapes + the most common combinations. My hands are slightly fire/water(lt) and earth/air(rt) ,but are not unusual looking palm shape. Probably because they still are in the normal range. Edit: Wouldn't they just be rt./air and lt/fire? ps I don't know how (did not have hand flat on surface?) but I messed up my lt palm measurement in original post. The picture above is a first attempt to illustrate the fundamentals of the mixed hand shapes; the central yellow zone represents the hands which are sort of a combination of all 4 hand shapes (the average for males and females is found in this central zone... so this central zone probably relates to a significant number of people). By the way, I think the 'mixed hand shape' zones could also be presented a little bit wider than shown in the picture. Any suggestions??? Very nice to see how Tap tried to related her (corrected) values in this perspective. - her left hand is actually inside the start of the mixed zone for a water + air hand shape. Hi Tap, how does this sound to you? I hope the picture demonstrates how the 'frame work' could be used to classify hand shape... and the 'mixed hand types'. I understand the chart better with the areas marking mixed shapes. But I still am not sure about how the left hand was figured. her left hand is actually inside the start of the mixed zone for a water + air hand shape. I have the finger to palm length at .755 (7.7/10.2 = .755) so wouldn't that put me below the air section and into the fire section? Wouldn't that make my left fire? Edit: Isn't the middle /dividing marker for fire vs air .77? Martijn, the picture isn't right. eg green zone for earth hands should not reach higher than 0.8 on finger length vs palm length ratio. Another difficulty I've got with the diagram is that we measure the palm across the centre, not across metacarpals, so likely our measurements are wider. Whilst fire & water, and earth & air are antagonistic elements, I do see a lot of fire/water handshapes (rectangular palm, slightly narrower than standard fire hand but fingers shorter than water hand). I don't see earth & air combination hand shape often because people usually live either more in the physical or more in the mental realm. I've seen it e.g. on master craftsmen who use brawn and brains! Ah... yes Tape, sorry for the confusion: I had used the other value (that you reported in the other topic). Your new value for your left hand shows up in the beginning of the mixed fire + water zone (not in the fire zone). Sorry for the confusion with the previous post. That definitely makes a difference. Esp. with spatula shaped hands, like in my case. This is a good point! I had noticed earlier that if I hold my hand like the little sketch with fingers spaced my hand is wider across the metacarpals than when the fingers are held together. I took my measurements with the fingers held just slightly apart. It would seem that focusing on the metacarpals would give us a measurement of skeletal aspects but not really the shape of the hand. And you are right Tap to point out the spatulate shape. There is a big difference in the spatulate hand that is wide at the fingers vs the spatulate hand that is wide at the wrist. However, I don't think the elemental system works with this shape or conic (rounded) as it's more about length vs width. (probably why in the elemental system you end up with so many "mixed" hand shapes. Hand length vs. width at limited points really cannot express hand 'shape'. Lynn wrote: Martijn, the picture isn't right. eg green zone for earth hands should not reach higher than 0.8 on finger length vs palm length ratio. Lynn, regarding your first comment... remember that we started talking about the significance of palm width? Well, this probably implicates that as soon as you start adopting the consideration of both palm width combined with palm length... the old 0.8-criterium regarding palm length is no longer a necessary requirement, because considering both palm width AND palm length gives a more precise result... and this new 'frame work' explains why it leads to other criteria! Lynn, please be aware: the 'earth hands' that have a palm length (slightly) above 0.8 - which are found in the upper half of the green zone... always have a broad palm - see the picture. Does this now make sense for you? By the way, I do think that this is a key-issue regarding the question: how to define the difference between an earth hand shape and a mixed (partly earth) hand shape. It think your notification here provides me the argument to make the 'mixed hand shape' zones much larger than in the picture that I have just presented! Because, while making the picture... I have not used any specific criteria at all. But your 85% criterium in the perspective of palm length provides me a very solid argument to make a new (better) picture, and the 87% will continue to serve to recognize abnormally long fingers. By the way, this sort of implicates that the 'frame work' presents a new criterium for an 'earth hand': the finger length versus palm width ratio should probably be required to have a value below 0.9. So, I can not confirm your report of a mistake in the picture... because I would like to ask you here again to think a little bit more outside the box: think beyond the criteria that you are familiar with. Does this request make sense for you? By the way, I can add regarding your criterium: Fred Gettings' earth hand example did not meet your 0.8 criterium (though we agreed that his choice for that example may not have been the best choice... but I am sure that Fred would object to your argument regarding the 0.8, as Fred is using slightly different criteria, etc.). PS. Regarding the issue of how to measure palm width, we have talked about that in the past a few times. I think it is important to be aware that in the field of 'anthropometrics' hand width is always measured at the end of the metacarpals - probably because it relates directly to the bone structure, which represent the widest part of the upper palm! This approach is also (nearly) always used in scientific studies... and in quite a lot of books about hand reading as well, including the works of Holtzman, Birla & Sprong - my first teacher in the field of hand reading. And yes, the metacarpal approach usually results in lower numbers than your approach for measuring palm width, which implicates that the metacarpal approach is really a requirement for using the 'frame work' that I present: see the hand-illustration in my pictures! Good point. Regarding the picture, the right pointer should have been pointing to where the life line starts, because I found that is about the location where the metacarpals end. On the pinky side there is more variation, but usually the metacarpals ends at a location close to where the marriage lines manifest. If you adopt this approach, you will find that it hardly matters how the fingers are hold... because the metacarpals hardly change from position when you move the fingers! PS. Regarding Tap's point: the issue of whether a palm a squarish, spatulate or whatever... is irrelevant here, because that goes beyond the perspective that we are talking about. For, that issue much more relates to the size of the mount of venus + the size mount of moon, and by the way this also plays no role at all in the approach when the width of the palm is measured just above the implant of the thumb! So, this is kind of more a fundamental issue of the ELEMENTAL APPROACH. And therefore it become completely irrelevant in this 'frame work'. Because in the elemental approach there is no consideration for whether a palm is 'squarish' or 'spatulate'... those words are part of the d'Arpentigny vocabulary for the 7 hand types - which are generally today considered as belonging to the 'old palmistry' school. Thanks for your answer Lynn (partly confirms my expectation). why it leads to other criteria! No sorry it doesn't make sense. the definition earth hands are that they have short fingers. Therefore no earth hands could be above 80% (medium) finger length to palm length ratio. Likewise water hands have long fingers, therefore no water hands would appear below the 80% because then they would have short fingers. 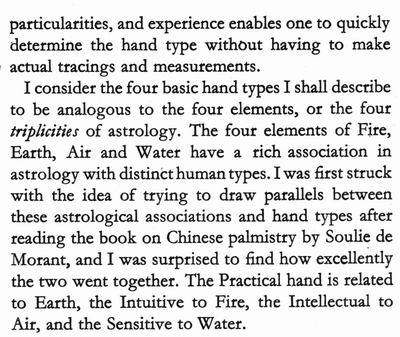 Perhaps those that use the elemental system see the use of 7 types as old school, but they are still quite functional as a system taking into account that hands are not shaped like boxes, and includes the ever popular mixed hand shape. Again the concept "shape" really isn't described by length and width or their ratios. Maybe that's why there is confusion in Johnny's text using the words type and shape. I'd suggest that instead of altering the 5 Element 'shape' system (with 4 elements) already in place, you rename yours something to the effect of hand 'size' ratios. Perhaps you meant heart line rather than marriage line - as the heart line is usually under the metacarpal. By the way, there are charts showing the span of movement between the metacarpals with the index and little finger having the widest range. The metacarpals are not fixed or locked in position. Google image search for hand x-rays. Here is it pretty obvious that hand "shape" is more than the length and width of the skeletal structure. Patti wrote: Here is it pretty obvious that hand "shape" is more than the length and width of the skeletal structure. Yes it is, but in the 5 element system, when we talk about hand shape we are simply looking at the general shape of the palm (square or rectangular) and the length of the fingers relative to the length of the palm (short or long). All other characteristics such as bent fingers, knotted knuckles, spatulate palm, etc would be assessed separately, in conjunction with all other features. Like doing a jigsaw, building up a picture of all the different features. The difficulty I have with D'Arpentigny's 7 shapes is that he is taking into account too many features in each category eg spatulate fingers, knotted knuckles etc and so in his system most hands seem to end up as 'mixed'. I prefer the elemental handshape classification that I learnt in Cheirological Society, but of course that is just my personal preference.